If I'm perfectly honest with you and myself both, it's not much of a tree. You've seen the Charlie Brown tree in that Christmas special, right? I'm sure you have, even I did once when I was trying to block out the noise. Well, that tree, as small and bent as it was, puts this one to shame. I'm not complaining, mind you. 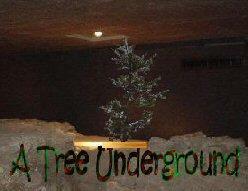 In a way this tree is fairly special since you rarely find trees under the ground. All this sand, I'm surprised he didn't come back with a cactus. He joked about that, but not out loud. Even though there are few thoughts of his I don't overhear – not that I want to – it came as a surprise when he brought the thing down here wearing a slightly apologetic, slightly proud look on his face. I told him it was great, since that's what he really wanted to hear. But not from me, of course. The problem came when he asked me about traditions, and wanted to know how I'd decorated trees in the past so he could venture out again, even though it's dangerous, to try to replicate past holiday cheer. I thought a little, then offered the fact that one year, amongst my friends at the school, we'd strung snowflakes cut from white paper. I know he expected me to say more, but there isn't really more. I was only eight when they came for me, and told me that I was special. Like all kids that age, I didn't want to leave my parents, but my parents let me go, thinking it would be good for me. You'll be famous, you'll be rich…what parent doesn't dream that for their child? It's funny, but every night I'd cry myself to sleep, wishing that I could stop pretending to be this big deal, never-lose prodigy, but now, I can't even remember exactly what they looked like. I know they both had dark hair, and I think my dad wore glasses. Sometimes I wonder about them, hoping they're not dead, but they could be. For all I know, they were killed around the time they drilled that hole in my head, and Agent Scully told me she'd get them, but didn't. If she could have, she would have, and since she didn't….I just hope it didn't hurt too much. Maybe we celebrated Christmas when I was a little boy, I really don't remember now. Every time I try to imagine a tree, the ornaments turn into chess pieces, and I stop imagining because it makes me think of manipulating, having been manipulated, and being a pawn in sinister games. I think maybe Mulder can read minds too, because as I stood there, and these things ran through my mind, he smiled. A real smile, not like the sad ones he isn't even aware of when he's thinking of Agent Scully and their baby, and said " That's good enough, Gibson. Paper snowflakes are enough." But it's not enough. Enough would be him going home and spending time with his son, instead of a boy his relationship to is shared experience and shared fear instead of shared blood, and enough would be me seeing my folks again to ask them if we had any traditions before I was taken away from them; enough would be an escape from walls of sand I keep dreaming are going to fall and crush us both under their weight. A tree under ground decorated with paper snowflakes… I know it means something, but I'm not sure what.